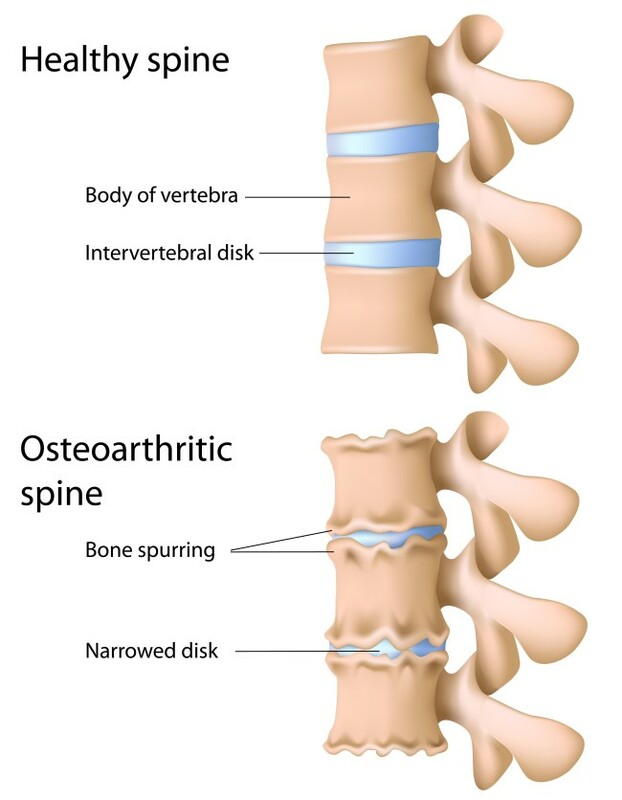 Degenerative changes of the spine refer to the premature wear of the tissues forming the functional connections of the bony elements in the spine , that is, intervertebral discs ( spondylosis , spondylosis deformans ) and the small facet joints (, spondyloarthrosis deformans ) . Usually both forms occur simultaneously. Degenerative process may develop in the cervical , thoracic or lumbar region. Due to the fact that this disease is largely associated with the aging process, it most commonly affects the elderly , but it is also found in nearly a quarter of people up to 40 years of age. The predisposing factors in the development of degenerative changes mostly include a history of injuries in the spine area , a prolonged stay in the non-physiological positions ( eg. at work) , the lack of physical activity . The degenerative changes may also develop in the course of certain diseases , such as scoliosis , spondylolisthesis , rickets , Scheuermann’s disease , Forestier's disease , rheumatoid arthritis ( RA), ankylosing spondylitis (AS). As a result of wear and dehydration , intervertebral discs lose their elasticity. Their middle part is collapsed , and the outer part which surrounds the nucleus pulposus bulges . It causes the increase of the pressure on the edges of the cartilaginous blades forming the articular surfaces of adjacent vertebrae , due to which an overgrowth of bone in this area occurs, forming the so-called osteophytes , or bony spur visible on radiographs . If osteophytes develop on the side and front part of the vertebrae, they do not give symptoms of pain , but if they are formed on their rear part , that is, on the side of the vertebral canal, they can narrow the spinal canal and irritate the cord and nerve roots located in the canal. Moreover, the hypertrophy of the spine ligaments and articular capsules of the spine occur, which leads to a greater narrowing or even obliteration of the spinal canal . The advanced stage of the disease is marked by the development of instability and deformation of the spine. Initially, the development of the disease is not evident. When the degenerative process is already advanced, the pain, the limited mobility of particular spine section as well as the and morning stiffness is observed. The pain mostly occurs as a result of the prolonged stay in a forced position, after increased exertion or while performing particular movements, such as bending. This pain may increase along with the weather changes and the range of movement, whereas it disappears or weakens at rest. This is a distinctive feature which differentiates the pain caused by degenerative changes from the back pain caused by other factors. The pain caused by pressure on the nerve roots is a radiating type of pain.. These symptoms are quite typical, however, depending on the section of the spine affected by the degenerative process, the profile of the patient can vary considerably. Spondyloarthritis of the cervical ( lordosis) spine (spondyloarthrosis cervicalis) most commonly affects people over 50 years of age. As a result of pressure or irritation of the nerve root, usually at the height of the C5-C6 or C6-C7 , the neck pain occurs, usually radiating along the upper limbs. It can be accompanied by numbness and even the paresis of the upper limb muscles. The development of degenerative changes of the cervical spine can also lead to the compression of the vertebral arteries and the changes of the blood flow in the brain, resulting in the occurrence of paroxysmal headache, dizziness, impaired balance, nystagmus, or tinnitus. Degenerative changes of the thoracic spine (spondyloarthrosis thoracalis s dorsalis) are characterized by the occurrence of dull, diffuse back pain, usually not too severe, located mostly at the top of scoliosis or developed in the course of such diseases as rickets or Scheuermann disease. Sometimes the intercostal neuralgia can also occur. Degenerative changes of the spine are localized most often in the lumbar region, which is clinically called the spondyloarthritis of lumbar spine (spodnyloarthrosis lumbalis). This disease most commonly affects men doing the hard work associated with lifting heavy objects, however, because of the loads exerted on the lumbar spine (especially when lifting weight from the ground in the position with straight knees) , it may also occur in other people exposed to this load. The degenerative changes of the lumbar spine section are observed in every fourth person over 40 years of age. However, it should be noted that the changes visible on the radiographic image changes do not always cause the symptoms of pain. Patients suffering from lumbar spondyloarthritis frequently complain of back pain, often radiating to the lower limbs, as well as the muscle weakness due to irritation or compression of the nerve roots or the spinal cord. Back pain most often radiates to the buttocks or along the lower limb, up to the foot. Also, an excessive, defensive muscular tension of the paraspinal muscles is observed, as well as the flattening of the lumbar lordosis. Sometimes the symptoms associated with tingling or numbness may also occur. In some patients with spondyloarthritis there is also inflammation of other organs, most frequently the iris of the eye (iritis), which causes pain and redness. Spondyloarthritis, like any degenerative process, is a progressive disease which cannot be stopped, however, it is possible to slow down its progress and alleviate the symptoms it causes.